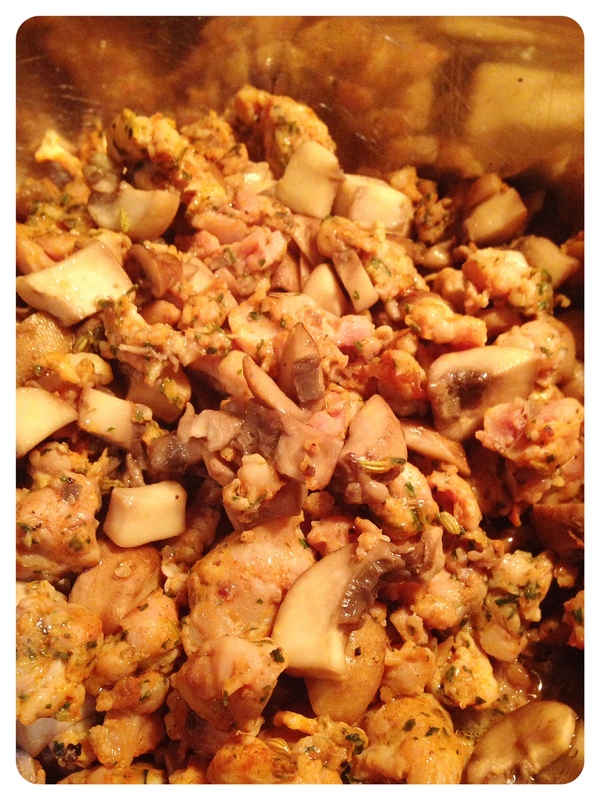 Savory Chicken Sausage and Mushroom Stuffing | Kitchenpants! The above note is courtesy of the Kitchenpants! tasting committee. 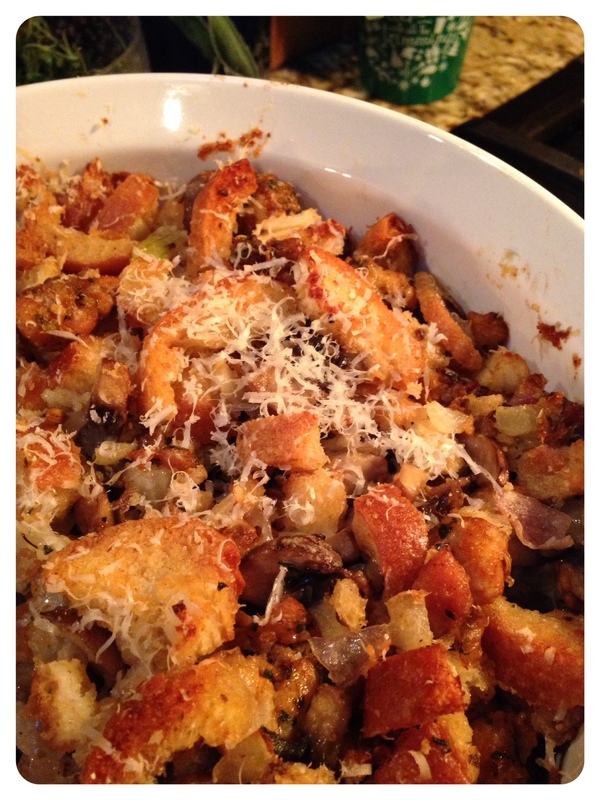 Make this stuffing and you, too, could receive such reviews. 3 Cups Cremini Mushrooms – Large Dice/Slice and omit the stems. 10 Cups Quick Garlic Croutons – Regular dried-up bread will not do in this recipe. You will likely need two baguettes to achieve 10 cups. 3 Tsp. Fresh Sage – This is to start. You can add more to suit your taste. 1 Tsp. Fresh Thyme – This is to start. You can add more to suit your taste. 1/2 Cup Freshly Grated Parmigiano-Reggiano Cheese – You may substitute Pecorino Romano if you wish but if you do, watch the salt. Heavy-Bottomed Skillet – I use a LeCreuset Skillet, but any heavy bottomed skillet will do. 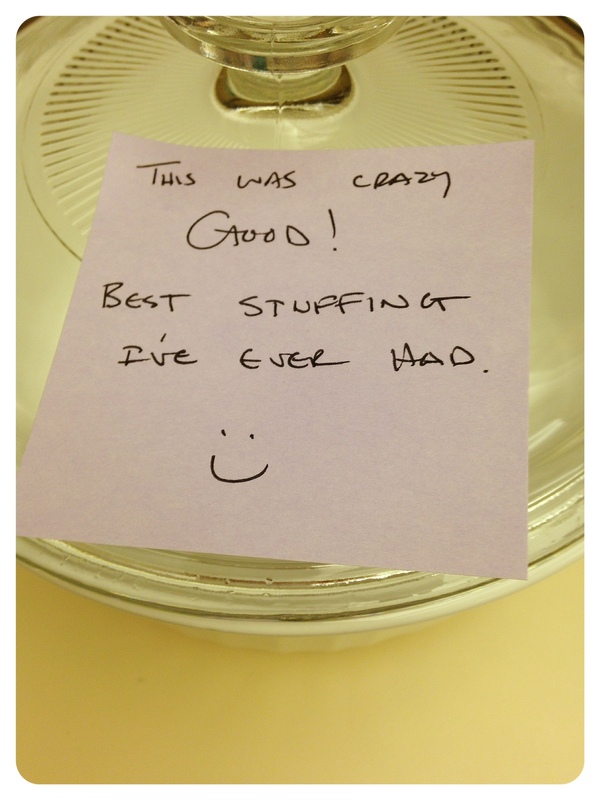 Round Baking Dish -I use a Corningware 2.5 quart dish. The first part of the recipe involves making three different items in the same skillet. Don’t wash the skillet in between because you want the flavors to build up and work as you cook each item. That said, be careful not to burn anything. If you get too much browning on the bottom of the pan, deglaze it just a bit between recipes by adding a bit of chicken broth and working the bits off the bottom with your wooden spoon. You can then dump the chicken broth, or keep it in another bowl for the end of the recipe. Use your mushrooms, part of your butter, and oil to make Julia’s Mushrooms in your skillet. Don’t add the green onions and use just a pinch (!) of salt and pepper. Don’t crowd the mushrooms! You will have to make the recipe a few times. Remove the mushrooms to your mixing bowl and set them all aside. There will be fluid in the mushrooms. That’s ok. Leave it in there. Slice the sausage from end to end and empty the contents out of the skin. Discard the skin. In the same skillet as the mushrooms, brown the sausage. You might need to add a dash of oil to the pan, but the butter from the mushrooms should give you plenty of fat to prevent the sausage from sticking. When the sausage is browned (but not too brown – don’t overcook it because it’s going in the oven later), pour it into your second mixing bowl. In the same skillet, melt 2 tbs. of butter. Add the onions, shallots, and garlic and sauté until golden and soft. When the onions, shallots, and garlic are done, mix them together with the mushrooms and sausage. Crush up the garlic croutons to chunks and stir them gently into the mix. Check the mixture to see how moist it is. This is the trickiest part about stuffing. If you have ever had stuffing that was too dry or too wet, it’s because someone messed up this part. Add chicken broth to the stuffing in small increments and check for moisture.You want the bread to be slightly wet, but definitely not mushy. There should be crunch left in the bread if that makes sense. Stir in your sage and thyme. Taste the mixture and add more herbs as needed. Remember, fresh herbs are very strong and there is sage in the sausage already. Don’t add too much. When in doubt, add less. No one is going to tell you if the stuffing doesn’t have enough sage or thyme, but they will tell you if it has too much by leaving it on the plate. Bake uncovered in the oven for 30 minutes, or until golden and hot. Sprinkle with a little grated cheese right before serving. How does a cooking impaired but culinary adventurous girl and her beau get on the Kitchenpants! tasting committee??? Grab your fork! You are now a member.